I have read the whole of this book over the last couple of days (it is only short – about 90 pages of writing in total). In terms of Goodreads, I have given it three stars (which according to my sidebar means – Liked it (I enjoyed it enough and may read it again but it didn’t fully grab me)). Now, this probably isn’t really all that far because it is kind of an academic type text so it was always going to be trickier to get a 4 or 5 star rating (though on the other hand there have been some academic texts I have wanted to – or possibly even have – kissed!!). In terms of my PhD – it has a few potentially useful bits in there. This is a concise book written by Robert D. Richardson which combines an biographical ‘study’ of the writings on writing of the poet and essayist Ralph Waldo Emerson, with some snippets from Emerson’s writings/journals etc. It is split into 12 short sections such as ‘Reading’, ‘Sentences’, ‘Audience’ and ‘Writing’. I enjoy reading writers writings about writing (!!!) and that is what attracted me to this book. I guess then that I felt that there wasn’t enough of that and too much analysis (see I said I was being unfair). I also didn’t really know anything much about Emerson and didn’t feel I truly got to know him from this book. Funnily enough after struggling with the Dialogism book some of what was said in this book I made links back to that which helped with my comprehension. That being said I will share with you a few snippets/quotes that I enjoyed and that speak to my experiences. ‘Reading long at one time anything,…destroys thought as completely… Stop if you find yourself becoming absorbed.’ (p.15)(To Emerson reading was to be useful to his writing – personally I disagree and love nothing more than getting absorbed in a good book which can leave me thinking for ages afterwards if I let it). 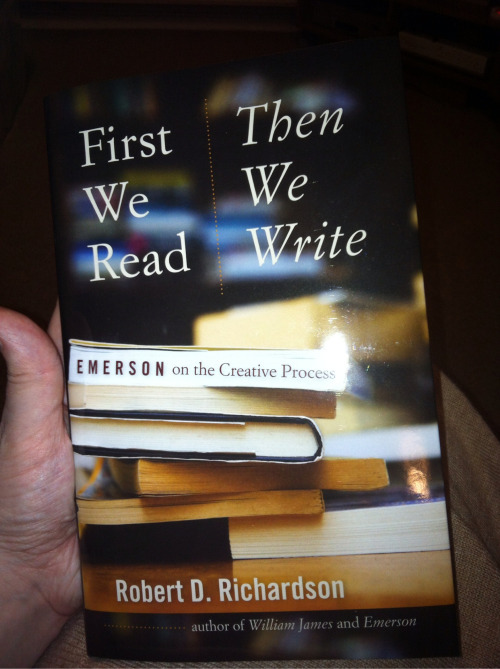 Richardson argues that Emerson’s essay ‘The Poet’ suggests that ‘…expression, including self-expression, is a basic human need, and is the fundamental function of literature.’ (p.71) (Interesting concept in terms of my planned research). What Emerson poems do people recommend I read? Do you relate to any of the quotes above? Posted on April 6, 2013, in April A-Z Challenge, Book Reviews, OT/Lecturing/PhD Reviews, PhD and tagged A-Z 2013, Emerson, First We Read Then We Write, Ralph Waldo Emerson, Robert Richardson. Bookmark the permalink. 12 Comments. I’ve never actually read much Emerson, and I’m not sure this would really be the read for me, although I do like some of the snippets you shared. I think if you can find some original full Emerson’s writings it might be more engaging?? This actually sounds pretty interesting. I just may have to check it out. Thanks! Check out the book on today’s post for G – think you’d enjoy that one too. I didn’t know about this book but now I’m really curious about it. I love books on writing and this one intrigues me. Thanks for sharing about it! It won’t take you long to read at all. I’d love to seek out more of Emerson’s essays. This is more academic textbook sounding though – not as accessible as King’s or today’s (G) book. The only time I read Emerson was in school. I remember his poems were good, the full length writings lost me. Thanks for commenting – I will check out his poems after the challenge is over. Hello! This sounds like a really interesting book. I love reading what writers have to say about writing, too. I’ll have to check this out from the library! You’ll love today’s book then (G) – I think I have a couple more coming up too.